Last week Woodlore ran the first Camp Craft course of the season, spending the week outside in the woods, surrounded by the beautiful bluebells and soaking up the start of spring (better late than never!). The students left on Saturday afternoon with knowledge of various axe techniques – including how to fell, limb, section, and split timber – as well as ways of creating a comfortable camp area to live in the wilderness. 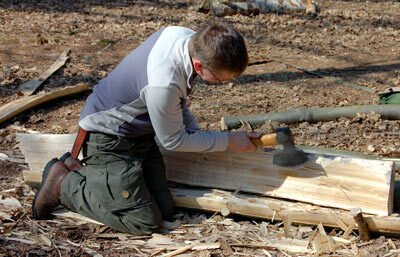 This entry was posted in Bushcraft Courses & Expeditions on April 27, 2010 by Woodlore Team. I really enjoyed my course. It was hard work, but definitely worth the effort to see what you have made at the end of the week. You build up on the skills you learnt on the fundamental course and it takes you further. Highly recommend attending. Thanks for the feedback Katie; great to hear you had a good time.